Above is the packaging that my OttLite came in. These come in a number of colors/patterns, so I was excited when I removed the mirror and saw that it was the same black and white print shown on the box! 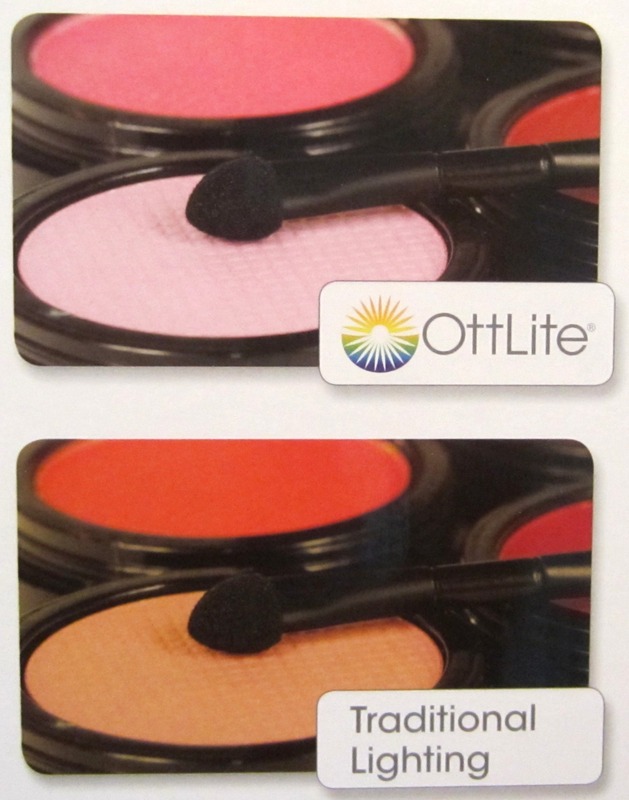 The images below were taken from the box, and show some of the highlights and details about the product. It folds fairly flat for easy storage. I don't use a makeup mirror too much during the months when the sun rises early, but I definitely use mine quite a bit during the Fall/Winter months, so I appreciate the ability to store it without taking up too much room. 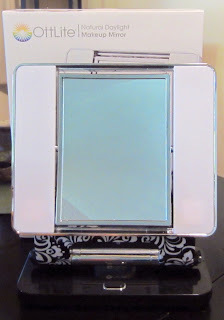 My current makeup mirror has the switch on the cord, while the OttLite has the on/off switch located more conveniently, right on the base. 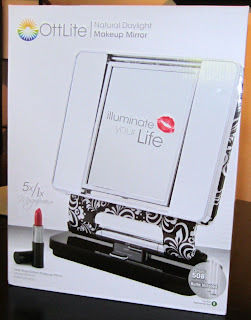 Let me tell you a little about the OttLite makeup mirror...this has an adjustable base that you can tighten up once you have it positioned to your needs. 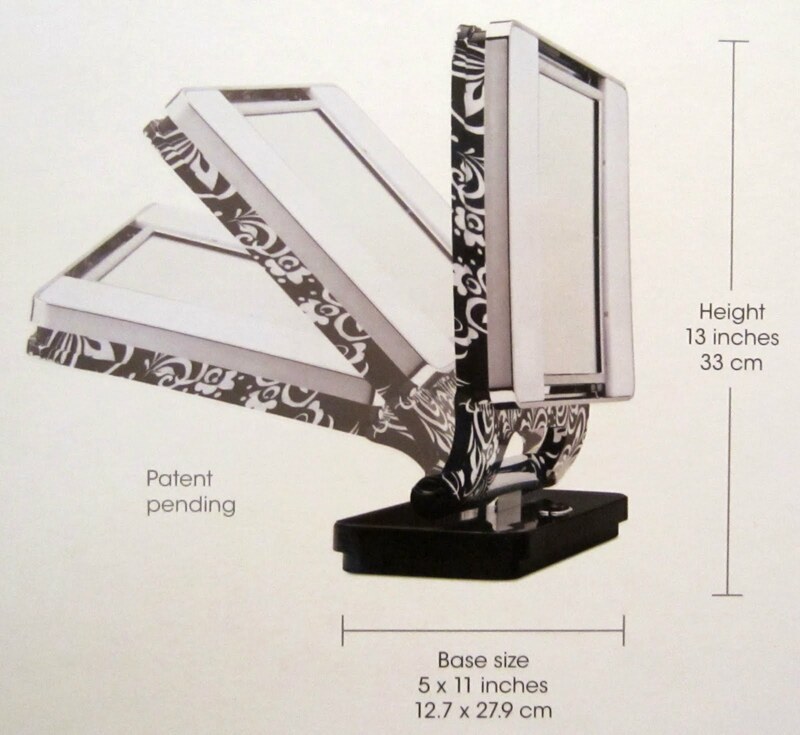 The mirror itself simply flips/rotates over to change the magnification from 5X/1X. To fold it for storage, you simply loosen the thumb nuts on the base. My current makeup mirror is almost ten years old, and while the lighting is adjustable on that one, whereas it is not on the OttLite mirror, it just never seemed bright enough to me. The OttLite is so much brighter! When I first turned it on, I though it might be too bright, but after using mine for a couple of weeks now, that isn't the case at all. I did a side-by-side comparison a couple of times, which allowed me to see what I'd been missing using my old mirror. After applying my makeup in front of the bathroom mirror, which is what I usually do during the brighter Summer months, I set both the OttLite and my old Jerdon mirror up next to each other and compared the colors of my cosmetics, the blending, and so on. Entry Rules: If you'd like to enter for a chance to win this OttLite mirror, just leave your eMail address below in the comments section. Followers only, please. A reminder that all of the prizes offered this week will be open for entry until midnight, September 10. Facebook Friends, I've got a new giveaway for you tomorrow! This is so cool! I'm considering buying one even if I don't win. The lighting everywhere in my house is terrible, so this would be perfect! Thank you for the opportunity Mary! That looks amazing. I want one. ohh I've never seen these before! I would love to have one of these. It would help with my blog photos. That is such a cute mirror, thanks for the chance to win it! I love the design around it! What an awesome invention, I love it!!!! I have the lamest light in the house (which does offer the advantage that I can seem to look loads younger in the mirror if I just squeeze my eyes a tiny little bit, but may turn into kind of a shock in broas daylight :p) Thanks for yet another loevely give away! Hi there. Not sure following you via my Google Reader feed counts, but either way, great giveaway for your readers! I'm at everythingblue[at]gmail[dot]com. Thanks! Oh Mary, this is so cool! I have the worst lighting in my house. Thank you! This looks so cool!! Definitely sounds like a very useful product!! i love the design you got! jenlanay [@] yahoo [dot] com. And three cheers for fall! WOW this sounds awesome! I currently do my make-up standing up in the bathroom... ~hangs head in shame, LOL~ My email is chowyuktingterry@gmail.com! I'm always struggling to get enough light for doing makeup... this would be perfect!! such a cool giveaway I think my mom would really like something like that...christmas idea! You are so sweet for having all these giveaways. 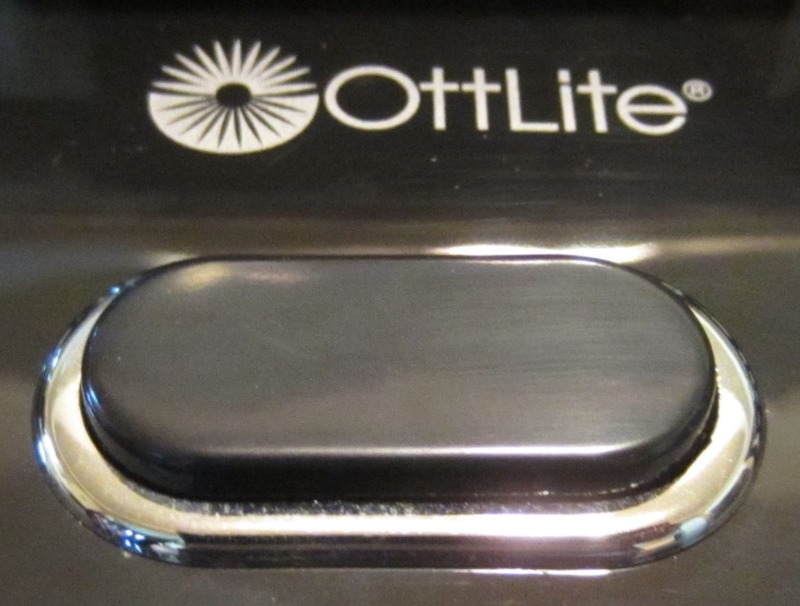 This Ottlite Mirror seems fascinating. This sounds wonderful. I need this desperately! Thanks Mary. it sounds amazing! so much nicer than my makeup mirror! This is a totally awesome product! Thanks for giving us readers the chance to use it! What an awesome prize!I've been craving an OTT since I moved and lost all the natural light because the house is facing the wrong direction. i had no idea they made mirrors...now i need this in my life! Ooh, I could really use this mirror - thanks for the giveaway! Oh wow. That mirror looks great. Do want ;D Thank you for the giveaway! Thanks for the chance, Mary! This looks like just the thing I have been looking for to put my makeup on in my bedroom. I do have a window but I also have snoopy neighbors to the blind needs to stay shut for peace of mind. This would be wonderful! That mirror is so cute! I'd love to win and try it! oooh great giveaway. This mirror has been on my wishlist for over a year. wow super cool! I want one!! I have been needing a mirror. Thanks for the giveaway. Follower here, my email is my google blogger name @ GMAIL.com. I have and use the Ottlite for my violets at my home and it has worked great for YEARS! What a great and well needed product! I have horrible lighting in my bathroom. I go outside with a mirror to pluck my wayward hairs under my brows. I was just thinking that I need a good makeup mirror. Thanks for the detailed review! I've been seriously considering getting one of these for my crafts and polish so this is a perfect giveaway! I'm following with google and my e mail is ladyothelake41athotmaildotcom. im an ocd plucker, i would love this! 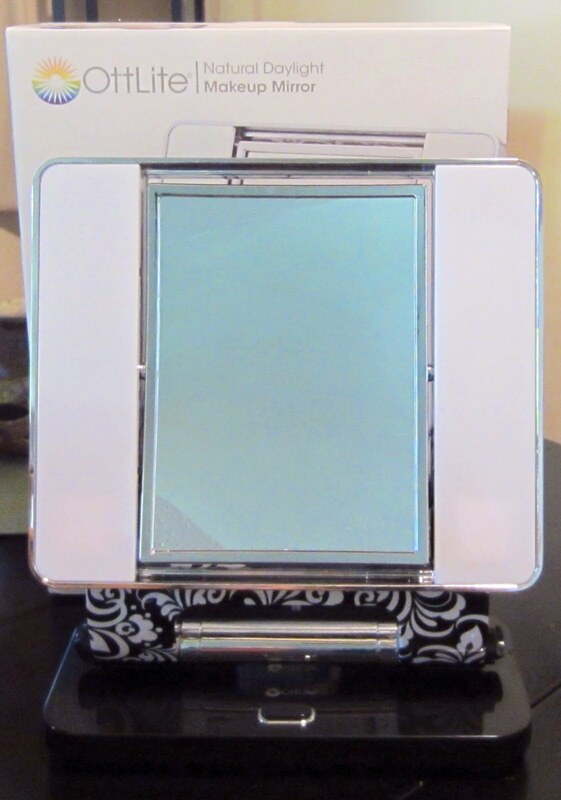 I had no idea they made a makeup mirror! What an awesome giveaway! hiya! i follow you via google reader! my email is stolengraces AT gmail DOT com! i've never won ANYTHING, so fingers crossed! I've never heard of them, it seems so cool! Another great giveaway. I've never heard of these! That's definitely going on my birthday wishlist! What a useful little mirror. This is totally better than my makeshift table lamp + wall mirror! lol! Enter me please. Btw thanks so much for this giveaway. Email is rotary girl (at) g mail (dot) com and I follow as rotarygirl via GFC. Awesome giveaway, I love OTT lights! Hope this doesn't double post, comments are being a bear here at work. oooh! I have no mirrors in my house that are actually useful - the one in the bathroom is completely etched and the other one I have are terrible cheap plastic door thing. If I do makeup it's in a compact's mirror. impossible for eyeliner! I'd say I need this!! thank you for sharing this cool product with us! it definitely seems like a must-have! Would I love to win this! That one looks awesome.....I totally need that! OOooooh makes my makeup mirror look like it's prehistoric! Its amazing how different the colors look with the light!!! email follower - I didn't realize they had makeup mirrors. Such an awesome & unique giveaway! Nifty! Thanks for doing this giveaway! This mirror looks so convenient! Great for dark Michigan winters!! I had no idea they made this - what a good idea! I could certainly use some good lighting in my dingy little apartment for makeup application, haha!